EL Castillo De Esparza also known as the "Castle" is famous amongst the rich and famous and now available for rental. 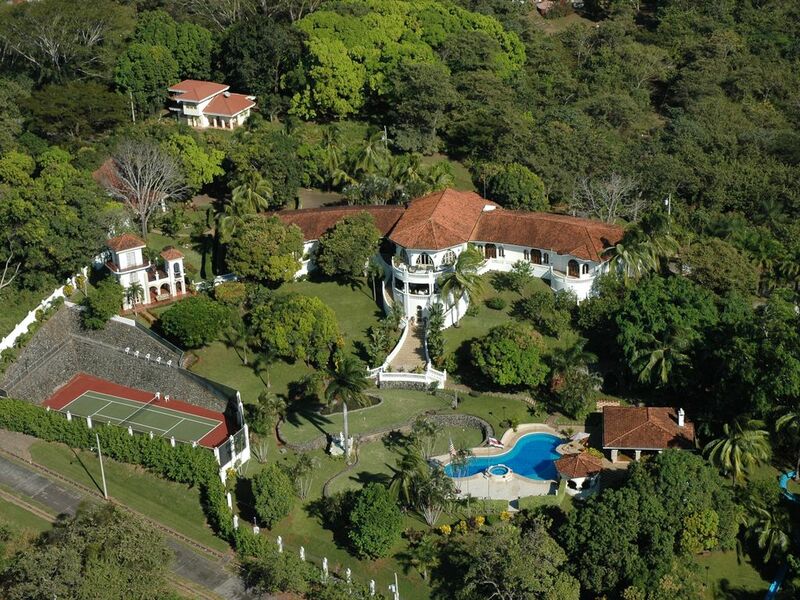 El Castillo De Esparza is the most prestigious, luxury Private Estate/villa (El Castillo De Esparza) in Costa Rica. This secure, private estate (over 45,000 square feet) is perfect for romantic getaways, family reunions, friend getaways, corporate retreats, celebrity rental, incentive travel, weddings, and events. El Castillo De Esparza features 2 large multi-room suites and 8 spacious bedrooms. It can easily accommodate groups from 2 to 30! Luxuriate in the private pools, large hot tub, 175' water slide, golf and tennis court. A private spa is located within the walls and more! One of the most famous landmarks in Costa Rica originally owned by a Belgian Contessa, the Main House of El Castillo De Esparza was designed by a noted German architect who created the various spaces using Costa Rican hardwoods and artisans. Scroll Down to just above our photos and click the link connecting you to our virtual tour. Keywords: Estate, The Castle main house is 33,000 sqft, central air condition plus 2 guest houses, 10 bedrooms 10+ bathrooms, Spa, 2 guest houses, 175' Waterslide, pool with swim up bar, Full-time staff of 10 (all have been employed with us 10+ years), Chef Minor to prepare 3 meals a day, concierge, bartender, 2 housekeepers daily with turndown service, ground keepers Huge pool and jacuzzi, fitness equipment, Tennis/basketball court, chipping/putting golf greens, Life-size Chessboard, organize your own private fireworks or bands to dance the night away. Beautiful sunsets on one of our two verandas overlooking the Pacific Ocean, lush tropical landscape with waterfalls and fountains throughout, enjoy the sights and exotic wildlife sounds of Costa Rica. It is difficult to calculate the pricing of large group accurately through VRBO pricing so please contact us. Let us know how many persons are in your party so we can give you the exact pricing. This rate is less than the best hotels in Costa Rica...and you get exclusive use of the entire property....fully staffed by ten professionals including our award-winning Chef and a Concierge! Basically, figure a cost of $170.00 to $220 per person per night depending on the size of your party. Please contact me for exact rates for the size of your group as the matrix on this website does not allow us to always publish the lowest possible rate. For example, the rate for 2 is less than the rate for 30! Our rates vary on the time of year and the size of your group, but even with all our amenities, you are likely to pay less than if you were booking hotel rooms at Costa Rica's best hotels. And you don't have to go out to dinner at high priced restaurants when you have your own executive Chef prepare three meals a day to your requests using only the freshest of ingredients, fine meats, fish and shrimp, fresh local vegetables and fruits, something different every day.. Your clothes washed and pressed as appropriate on the same day! I grew up in the Midwest and have had a corporate life and entrepreneurial experience. Now just getting ready to enjoy retirement.....well at least less stressful activities. Please contact me for exact rates for the size of your group as the matrix on this website does not allow us to always publish the lowest possible rate. For example, the rate for 2 is less than the rate for 30! Costa Rica, aptly described as the Switzerland of Latin America is truly a land of Pura Vida ! The biodiversity is incredible and with more than 30 microclimates, the variety of activities is incredible. Our villa, located on a mountain close to the Pacific coast enjoys warm days with cooling breezes and does not have the intense heat you find close to the northern beaches of Guanacaste Yet we are only 5 minutes away from the closest beach. We can arrange private carnivals within the property, custom designed firework displays and an array of local entertainment, including some of the top Costa Rican groups, all on the grounds of the villa. Should you choose to arrive by helicopter, we feature our own heliport. 10 minutes away where you can feed the local white face monkeys and enjoy the beach. Classic Spanish setting....Central Park and Church surrounded by various shops. Surrounded on both sides are the mountains with lush landscaping. It is a short drive through the country side from the San Jose airport to Esparza. Along the new highway, you will see majestic mountains and farms. A rural feel, but close to everything. Beautiful typical Spanish town 5 minutes away with grocery stores and a playground in the center ot town. Market days are always fun. Located in and view of the first tier of mountains east of the Pacific Ocean. There are beautiful views of the Gulf of Nicoya, and the sunsets right in front of you from our verandas. View of the Gulf of Nicoya and Pacific Ocean from everywhere on the property. The sunsets are spectacular from our verandas. Our staff cleans your room and makes the bed all while you luxuriate by the pool. Our staff will have your laundry washed, dried, pressed and back to your room the same day ! The main house is 33,000 square feet with very high ceiling with a 2 level living room. 4 Refrigerators along with additional refrigerators in Master bedroom and Guest house 1 and 2. Microwaves in Main house and both guest houses. Our chef will prepare meals and snacks to your specifications to include cakes for special occasions. Included in pricing. (8) Blue Ray player available as well. CD players all IPOD friendly. More than 500 movies in our library. Lush tropical paradise groomed everyday with waterfalls flowing throughout. Multiple Verandas to view spectacular Sunsets. El Castillo De Esparza also known as the "Castle" is a stunning and exclusive estate with 4 bedrooms 4 1/2 bathrooms, 33,000 square feet of living space in the main house for $12,000 a week 8 people. El Castillo De Esparza has a full time chef (Minor with us for 15 years) and sous chef that will consult with your to provision and plan your meals for your entire stay Breakfast, lunch and dinner. Ana our property manager/concierge will work planning all your resort activies and country excusions. Also, 2 housekeepers, laundress, bartender/tourguide, gardener, grounds keeper. A large sparkling free form pool, 10 person Hot tub with a swim up bar. 10 Minutes from the beach. Surrounded by native tropical landscape with ocean views from one of the many Verandas. Suitable for all ages. El Castillo De Esparza has and additional 2 guesthouses for larger parties up to 30 people for an additional cost. (2) 2 pools. One pool exclusively used for our water slide. A Private Villa with spectacular amenities to accommodate up to 20 or more guests; excellent cuisine; amazing adventures; wonderful staff; Great place for special occasions with family and/or friends. We are very glad we lived up to your expectations again....thank you for these comments ! After your fifth trip we must be doing something right !!! We hope you continue to use us as your base for exploration and relaxation !!! Uniquely beautiful tropical hillside location. Amazing pacific views, spectacular sunsets, attentive friendly staff and great food. Thanks so much! El Castillo de Esparza was a dream come true vacation!!! It was a once in a lifetime vacation where we didn’t have to worry about one thing for the entire week! Breakfast, Lunch, and Dinner were prepared and served to us everyday for the entire week. We had a Full-time Bartender throughout the day that would prepare whatever type of drink we asked for and would make any type of kids drinks when asked :)! The staff cleaned all bedrooms and bathrooms daily and had same day laundry service when needed! It was super easy to set up tours throughout Costa Rica! Transportation was arranged for us, a staff member came with to help when needing anytime of translating through Costa Rica. A few tours we did were Zip Lining in the Rainforest, Monkey Beach, and Crocodile Tours. All we would recommend and do again! This is the perfect spot for any type of family vacation where you can truly enjoy and relax without having to worry about anything. Our kids had so much fun and were always entertained :)! The staff was amazing, very attentive and super nice! You could tell they truly wanted you to have an amazing vacation. The food was incredible, the Chef was amazing and was able to prepare meals for both kids and adults. Made the kids special desserts every night! We also brought extended family and the castle was so big that each person had there own space and could easily mingle or relax. I give this place 5 stars and hope to come back every year! I travelled to Castillo de Esparza with my 12 year old daughter and promised her a fairy tale vacation in a Castle. The staff and experience at the Castle was five star and made us both feel like Princesses! All of our meals were made to order and the staff helped my daughter collect mangos from the beautifully landscaped property. On the last night of our stay, the chef made a custom cake with a horse design for my daughters upcoming birthday. The cake rivaled anything I could have bought for her in Manhattan. We spend gorgeous sunny days swimming in the pool and she spend hours on the massive waterslide. We took trips to go ziplining and to see the crocodiles. One day we went horseback riding on a nearby black sand beach; the ride included a path through a mangrove jungle. It was amazing! All of the tours were recommended by the staff; who had personally experienced each of the adventures. I felt completely safe entrusting myself and my daughter to these adventures knowing the Castle staff had vetted their quality. At night we watched movies from the extensive in-house selection and played pool and billboards in the beuatiful living room. We’ve been to many Caribbean destinations and Costa Rica and Castillo de Esparza rivaled them all. It’s Paradise. The house was great we had 16 family members and had room to spare. Ana was excellent, she made sure we got everything we wanted and had the bus ready for everywhere we wanted to travel and see. Josue went with us on all of our site seeing and was a great tour guide and translator. I would definitely visit again. We were completely impressed by El Castillo and its staff. Well worth the trip to CR and to Esparza (easy drive or they can provide pick up/return service). It was indeed a luxurious Castel in the hills. The food was varied and prepared perfectly by the chef, served with style by the friendly staff. All amenities were as advertised and made our stay an escape from the day to day. One night we arranged a fireworks display (staff coordinated), several nights we had local musicians play during cocktails. The putting greens and elevations was so unique. Tennis and/or pickle ball was a blast on the tennis court. We can't say enough other than we will be back next year- we deserve it! Canopy Tours, ATV Tours, Crocodile Tours. Bungee Jumping, Deep Sea Fishing, Diving, Snorkeling and many more. Please inquire for complete rate information as group size can affect the rate. We are very flexible on payment schedules if the booking is longer than 6 months in advance of your arrival. Costa Rica requires a 10% gratuity added to the rental rate which is reflected in the fee schedule as property fees. Quoted is our weekly base rate for a group of 8 persons in the Main house 14 persons is $2600 per nite plus 13% tax of $338.00 plus a $260 per night gratuity For larger groups contact us for the applicable rate. We offer a 10 % discount for August through October rentals Two week minimum rental for Christmas and New Years at Christmas $60,000 plus applicable taxes and tips.